Representatives from Tidewater Community College, Blue Ridge Community College and the Community College Workforce Alliance of John Tyler and Reynolds community colleges sponsored a Health Informatics Summit in Richmond recently, bringing together experts from various facets in the health care industry to explore the new medical landscape and the role of community colleges in preparing the state’s workforce for the challenge. Health Informatics Summit panelists Dr. P.
TCC is already well established in the field, offering the only nationally accredited health information management program in South Hampton Roads. It also has a career studies certificate in electronic health records system consulting. The college trained more than 4,200 people in 11 states in health IT under a U.S. Department of Health and Human Services grant. In 2014, it received a U.S. Department of Labor grant of nearly $24 million that has a goal of implementing health IT curricula across all 23 of Virginia’s community colleges. While electronic health records are increasingly replacing paper as mandated by federal law, the need to optimize the data captured in those records for meaningful use is becoming increasingly important in efforts to improve patient care, patient safety and efficiency of operation. The workforce necessary to support health care’s new initiatives must be skilled in areas that range from medical terminology to governance of the industry to the information technology that can produce relevant analytics. 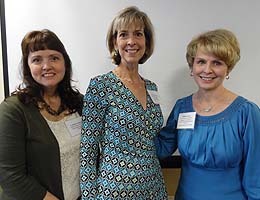 In addition to Detmer, panelists were Debbie Condrey, chief information officer at the Virginia Department of Health; Natalie Kaszubowski, vice president of information technology at Sentara Healthcare; and Dr. P. Marlene Capps of Tidewater Physicians Multispecialty Group West Point Family Practice. Kaszubowski stressed the need for a multidisciplinary approach critical for bridging the gap between our present system, still presented with the challenge of implementing electronic health records, and developing meaningful use to meet the long-term goals of the industry. She noted analytics – the intersection of science and art – as the next burgeoning job field “The emergence of data scientists will create another job family,” she said. Discussions of the educational pathways needed and specific curriculum are in the early stages as training and exposure in health informatics are necessary starting in high school. Glenn DuBois, chancellor of Virginia’s Community College, promised that the state’s community college will develop the workforce needed to move forward. For information, contact Michelle Charters, coordinator for health care workforce, at mcharters@tcc.edu or 757-822-7427.